The Ducks don’t have any more room to move atop the Pacific Division standings, and now their health is returning. 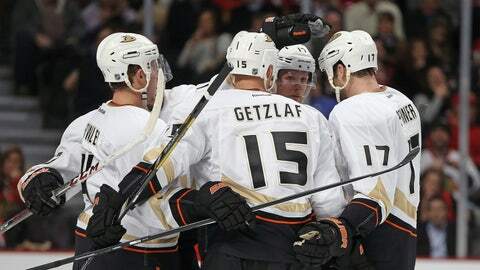 The Ducks don’t have any more room to move atop the Pacific Division standings and now their health is returning. Wednesday, the 22-7-5 team riding a 13-game home unbeaten-in-regulation start and seven-game unbeaten-in-regulation streak moved defensemen Alex Grant and Nolan Yonkman along with center David Steckel back to minor league Norfolk in anticipation of Sunday’s return of defenseman Francois Beauchemin, center Mathieu Perreault and defenseman Mark Fistric versus the visiting Edmonton Oilers. Forward Jakob Silfverberg, out since Oct. 25 with a broken hand after scoring four goals in the first three games, shot softly Wednesday and is expected back by Christmas. Beauchemin (upper body injury) and Perreault said they expect to play Sunday, and Fistric could be a healthy scratch. Beauchemin has missed 10 games since crashing into the boards Nov. 20 in a shootout loss to New Jersey. “I’ve been feeling better every day this week,” he said. “I needed rest and strengthening, had lots of time to do that. Grant departs after becoming just the third NHL defenseman since 1995 to score a goal in each of his first two games after beating Minnesota’s Josh Harding with a second-period slap shot that gave Grant two goals in his first two NHL shots. Norfolk has games scheduled Friday, Saturday and Sunday. “Alex Grant did really good, but he only played two games in 11 days here … you don’t get better by sitting around doing nothing,” Boudreau said. For those demoted from the Ducks’ success, Boudreau said he’s hopeful they leave with confirmation they can contribute on a good NHL roster.